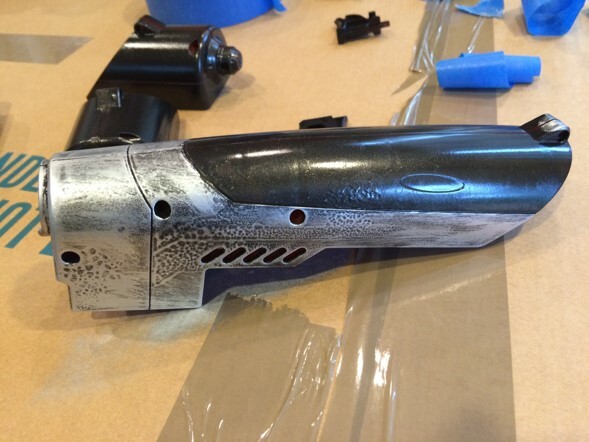 Star Lord Nerf Blaster Modification: Part 1 | Becoming Star-Lord. Time for my first big project: modifying the first Nerf blaster. If you haven’t watched my video showing the blaster and it’s cool features, you should check it out! This photo came from The Nova Props post on Instructables. You should check it out. Click the picture to go there! The first thing I did was consult numerous tutorials and guides. There are no shortage of them when it comes to customizing Nerf guns. It turns out, this is a very popular hobby! Instructables.com is one of numerous websites that feature templates and guides. 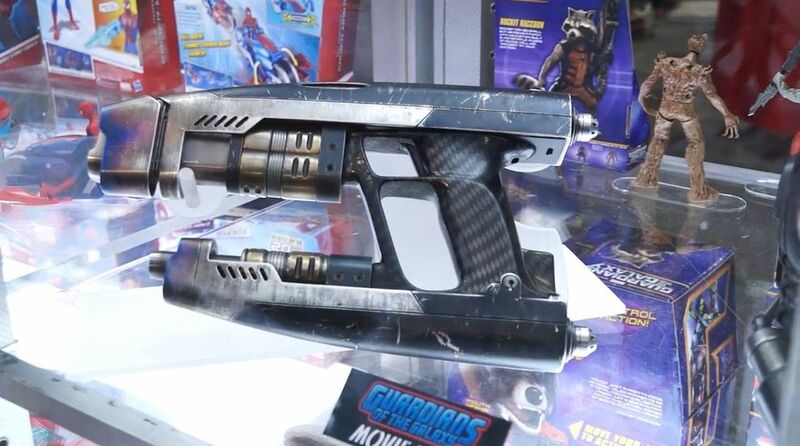 Nova-Props created one for the Star-Lord blaster that I found particularly helpful. 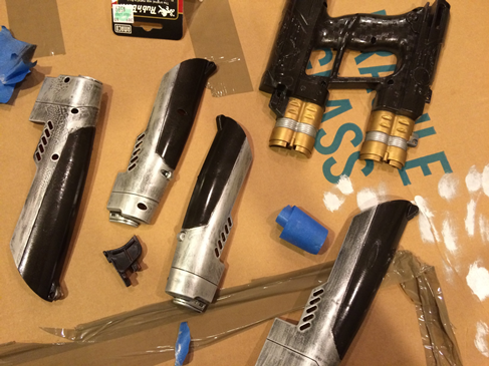 After buying the paints and supplies that I needed, I began by disassembling the blaster. Nerf Blasters come apart fairly easily. Getting it back together…that’s the tricky part. I made sure to take meticulous pictures along the way in order to help me get it back together again. It’s important to take it apart before painting, otherwise the paint can gum up the mechanics. It also results in a better overall paint job. After breaking down the gun, I sanded off the Nerf logo and other plastic text. I then sanded off the silver paint and the finish on the shiny plastic to help the paint adhere to the gun. 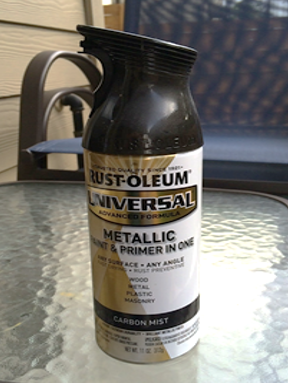 For a base coat, I decided to use a metallic, “carbon mist” black primer & paint. I thought the shine would give it a little more pop. I taped up one particular part I didn’t want to cover and proceeded to paint. (right) A part with an area I wanted unpainted covered with painter’s tape. (center) Parts after painting. 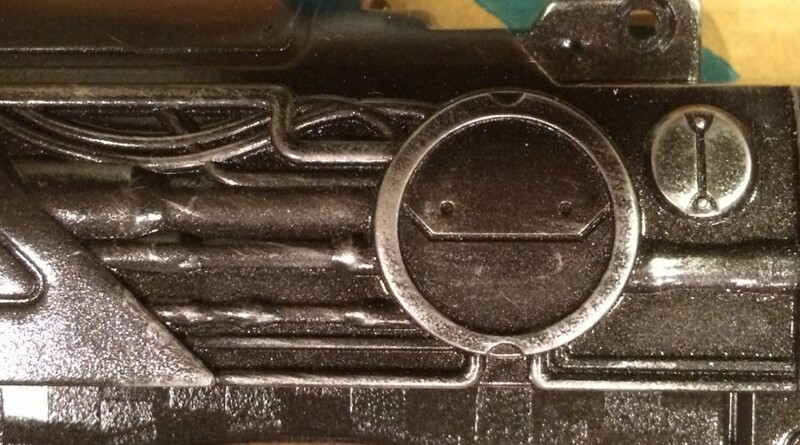 (right) A close up of a painted component. Now, I have to admit, I’m not very good at spray painting. If you’re going to do this, read some guides. Most pros recommend a few different, very thin coats. My first coat went on way too heavy. It didn’t run or gunk up any of the details, but I’m sure it could be better. After letting the paint dry, I began to work on the metallic details. Some people have used metallic spray paint on these parts, but, honestly, I didn’t trust myself not to hit parts I didn’t want silver. So I took some advice from Nova-props and used a product called rub-n-buff. It’s an interesting product. It’s like paint combined with wax. As the title implies, you rub it on (as opposed to “painting”) and can buff he paint into a shine. It’s a wonderful product. Now, you can see where the paint didn’t come out smoothly on the side. This was a result of poor sanding before spray painting. The other parts came out better, I swear. Still, I think I achieved the worn look successfully. I also applied the rub-n-buff to some of the corners and raised details. It helped with the worn look. 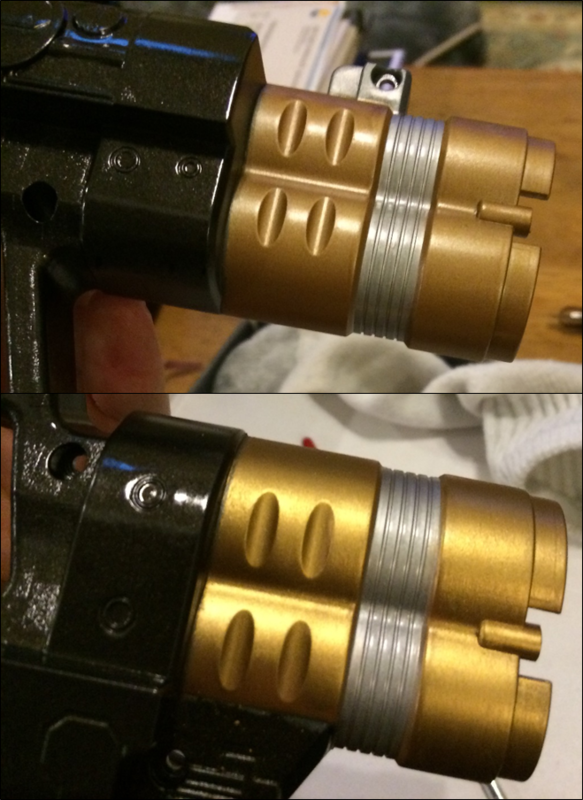 This picture shows my silvering efforts “in progress.” The next thing I did as give some attention to the gold parts of the blaster. Some people leave this part of the gun alone as it is the right color already. However, I didn’t. I took some gold rub-n-buff and applied it to give this part of the gun a little more pop. The gold rub-n-buff has been applied to the bottom picture. This was about four hours of work! Stay tuned for the finished product. If you enjoyed reading, I would appreciate any support for my fundraising efforts. CASA would too! This entry was posted in Blasters, Props and tagged blasters, cosplay, costume, guardians of the galaxy, Marvel, nerf, props, Star-Lord, Starlord, Superhero, toys on June 23, 2015 by Liam.